On Saturday, I went to Earls Court in London for the Gadget Show Live at Christmas. 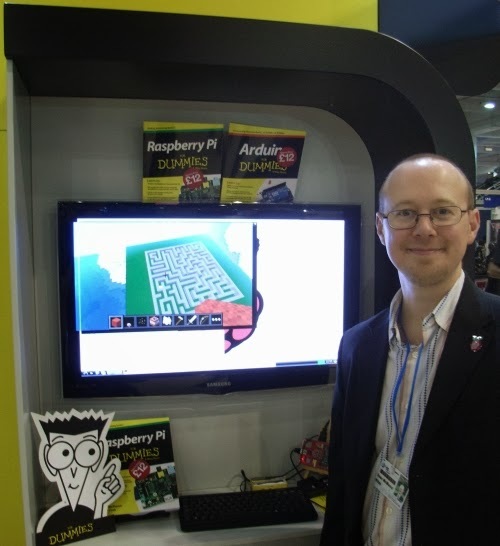 I took along my Raspberry Pi and was a guest on the For Dummies booth, where I demonstrated the Pi running Minecraft, Scratch and Python. Lots of visitors dropped by for a chat, many of them dragged to the stand by their children who made a beeline for Minecraft. I was demonstrating a Python program I'd made to build mazes in Minecraft. (You can find out more about my Minecraft Maze Maker, which will feature in the upcoming book Raspberry Pi Projects, here.) The children enjoyed playing the maze, while the adults were interested to see what the Minecraft craze was all about, and how it can provide an introduction to programming. I also demonstrated Scratch, and it was wonderful to see young people who were so enthusiastic about it. Many of them had encountered it through schools and had made games using it, although their parents hadn't seen it. Many of the parents remembered having programmable (or even self-assembly) computers when they were young. I met people who grew up on the ZX Spectrum, ZX81, Vic 20, Amstrad CPC and BBC computers, and who were looking for tools that would give their children the same opportunities to begin programming. I felt that many of them were inspired by Scratch and the Raspberry Pi and many said they'd look into setting up one or the other at home for the family. For many people there, it was the first time they'd seen a Raspberry Pi. Most people had heard of it, but many of them didn't really understand what it was, or why it was special. People seemed to think it cost about £80, which is I think because that's the bundle price at a major retailer at the moment, and they were astonished to learn the real price of the unit alone. If we had had some Raspberry Pi computers for sale, they would have sold like hot Pi. I enjoyed chatting to people and telling them more about what the Raspberry Pi can do. Some people dropped by to chat about what they could do with their Raspberry Pi having already bought one. I had a couple of friends who bought a Raspberry Pi and didn't really know what to do with it once they'd got it, and I had them in mind as I wrote Raspberry Pi For Dummies, so I knew this was a common situation. I talked them through some of the great things other people are doing with their Raspberry Pis, and I hope that they decided to take out the Pi for a play when they got home. On Friday, my co-author Mike Cook was at the show and demonstrated the Blast Off hardware project in the book too, showing how the Raspberry Pi can be used together with your own electronic circuits. We made the official Gadget Show Live Christmas Gift Guide, which was lovely to see. The guide included a shot of Raspberry Pi For Dummies and said: "Give someone the gift of knowledge this year with one of the excellent titles in the For Dummies range, offering clear and concise solutions to all sorts of tech problems." It was the first time I've presented the Raspberry Pi or Raspberry Pi For Dummies at a show like that, and it was a great experience. My voice is hoarse today from having to speak over the loud speakers opposite all day, and my legs ached at the end of the day, but it was wonderful to chat to other Raspberry Pi, Minecraft and Scratch enthusiasts, and to introduce others to these technologies for the first time. Thank you to everyone who stopped by for a chat, and special thanks to those who supported the book by buying a copy. Thanks also to Wiley for the opportunity, and to Polly, Lorna and Craig in particular. Thanks also to my wife Karen who spent all day helping out on the booth too. 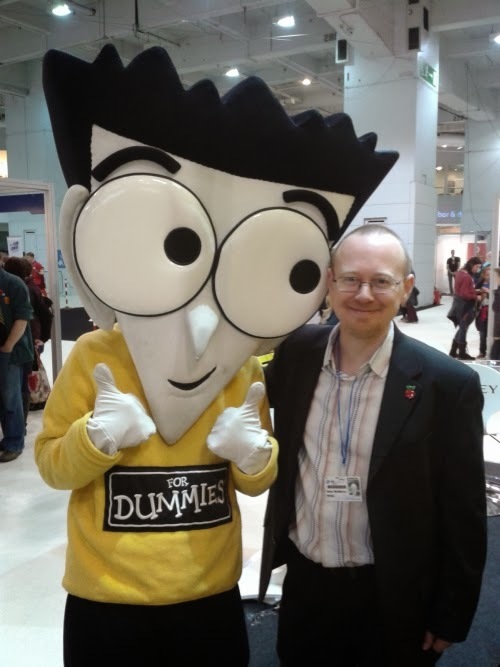 You can find out more about Raspberry Pi For Dummies here. If you follow that link, you can also download a free sampler from the book, and the cut-out-and-glue-together paper case I had one of my Raspberry Pis in. I've collected together links to online retailers stocking my books here.